Whether you scan your negatives or prints, or rely solely on a digital camera, a computer monitor is essential to help you view and edit your images. Yet it is safe to say that most people simply use the standard display that was bundled with their computer. When we review cameras, one of the things we judge them on is their rear display. Even with just a small camera display we have to consider the size, resolution, brightness, colour, contrast and reflectivity. Of course, all these considerations also apply to computer monitors – plus a lot more besides. 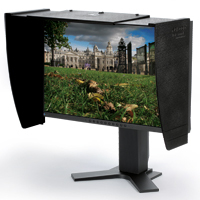 So when faced with a monitor specification sheet, what exactly should photographers be looking for? When choosing a monitor, the adage ‘bigger is better’ is often bandied about. While it is true that the larger the screen, the more space there is for viewing and editing your images, there are, in fact, a number of more important features to look for. Most monitors generally come in either standard 4:3 or widescreen 16:9 aspect ratios. Over the past few years, widescreen monitors have become more popular as many people like to watch films on their computer screen. Because of this, 4:3 aspect-ratio monitors are becoming less common. Remember, the quoted size of a screen is measured diagonally, which means a 21in, 4:3 screen and a 21in, 16:9 screen will not be the same height – the 4:3 screen will be taller. To get something the same height would require a 24in widescreen monitor. It is important to remember this if you wish to replace your monitor with one of the same height. As a rule, get the largest monitor you can afford but without compromising on quality. I recommend using a monitor that is at least a 21in widescreen model for editing photographs. Screens have an optimal, or native, resolution, which is expressed as the number of vertical and horizontal pixels, such as 1920×1080. While it is easy to assume that the larger native resolution is the better, it is also important to look at the pixel pitch, which is the distance between the centre of one pixel to the centre of next pixel. For example, a 21in screen and a 24in screen may both have a resolution of 1920×1080 pixels. This is because the pixel pitch of the 21in screen is smaller, say 0.248mm compared to 0.277mm on the larger screen. This means that, if you view the same image at full screen on both monitors, they will both show the same amount of detail, but the 24in screen will obviously show a larger image. However, if you are choosing between two monitors with identical screen sizes but different resolutions/pixel pitch, it is always better to purchase the one with the higher resolution/pixel pitch. This is because when an image is viewed on-screen at 100%, one pixel in the image represents one pixel on-screen, so the higher resolution screen will look clearer and there will be more of the image on-screen. The real difference comes when the images are shown at full-screen size, as they will show more detail on the higher resolution monitor even though both screens are the same size. It is hard to find older CRT (cathode-ray tube) monitors for sale these days as most have been replaced by slimmer, lighter and more energy-efficient LCD screens. However, there are many types of LCD panels. The most commonly used is a twisted nematic (TN) panel. While these have a fast response time, they have low contrast ratios and they are only 6-bit, although the number of colours can be increased using a dithering technique (see Colour section below). The advantage of TN panels is that they are very affordable. If a monitor came with your computer, then chances are it uses a TN display. Vertical alignment (VA) LCD panels have high-contrast ratios and good colour reproduction but slow response times, so they aren’t good for fast-moving images. They can also show a slight colour shift if viewed off-centre. Although more expensive than TN panels, they are still reasonably priced and a good option for enthusiast photographers. The best panels are generally thought to be Inline Phase Switching (IPS) panels. These offer the best colour accuracy and contrast, but the response time can be quite slow, so for video games and action-packed videos slight ghosting may be an issue. They are also expensive, although smaller screens should still be within the budget of many enthusiast photographers. A lot of people incorrectly set up their monitors to the maximum brightness value. This is because they assume that the brighter the screen, the better it will be, which is not entirely true. Screen brightness is measured in candela per square metre (cd/m2) and most monitors have a value of between 200-300cd/m2. However, if the screen is set to its maximum brightness value, images will look far brighter than they would when printed on paper. This is why a good monitor calibration device is important. Most try to adjust the monitor brightness to around 120cd/m2. However, ambient lighting also plays its part, and can fool our eyes into thinking that a display is too dark or too bright. For this reason, good screen calibration devices also take into account the ambient light in a room when calibrating a screen. Most monitors are backlit, and the tubes that light the screen become dimmer over time. When this happens it is important to be able to increase the screen’s brightness to compensate. So, unless you are going to be using your monitor in extremely bright conditions, any value above 200cd/m2 is fine. Contrast ratio is expressed as the ratio between the brightest and darkest values that a screen can display. Put simply, the higher the contrast ratio, the brighter the highlights and the darker the shadows will be, which helps the tonal separation of the display. Typically, a value of 800:1 or greater should produce a good level of contrast for a photographer’s needs. However, the actual level of contrast may be lower once the screen has been correctly calibrated. Confusingly, many manufacturers advertise the contrast ratios of their monitors as being far higher, with near-impossible figures of 80,000:1. These impressive ratios are actually the Dynamic Contrast Ratios, and they vary hugely from a standard, static contrast ratio. A static contrast ratio is the level of contrast that a screen can output at a given moment.Dynamic contrast is variable, and the ratio refers to the maximum range of contrast that can be produced by a screen, but not necessarily at a given moment. For example, when watching a scene from a film that is particularly dark, the screen may increase its brightness so that shadow detail can be revealed, to the detriment of highlights. The contrast ratio at that particular moment is, say, 700:1. Conversely, if the next scene is particularly bright, the rear illumination of the screen may darken to reveal highlight detail, but at a loss of shadow detail. The contrast ratio may still be 700:1, but it now covers a different brightness range. When editing images, only the static contrast ratio is important, so always go by this figure where available. The response time refers to how long it takes a pixel to change from one state, or colour, to another. still-image editing. It is more important, though, with moving images, as a slower response time can cause a slight blurring effect when moving images are displayed. Look for a monitor with a response time that is faster than 8ms. Like the screen on the rear of a camera, the viewing angle refers to the position around the screen that an image can still be clearly seen. The brightness, contrast and colour of a screen may look different if the screen has a poor angle of view, which in turn can lead to images being incorrectly edited. Look for a screen with a high angle of view and be sure to sit directly in front of the screen when editing images. The more colours a screen can display, the more accurate the colour rendition will be. Different manufacturers sometimes express colour values in different ways, but most advise how many different colours can be displayed and by what method. Most screens are either 6-bit or 8-bit, allowing either 262,144 or 16.7 million different colours respectively. However, things are not quite that straightforward. Many screens, most notably 6-bit models, use a technique called dithering. This allows pixels to rapidly switch between two different colours, which fools the eye into perceiving a third colour. There are a few different types of dithering that allow a 6-bit screen to produce either 16.2 or 16.7 million colours. Some 8-bit screens also use a dithering technique to allow them to produce the equivalent of 10-bit, or more than a billion possible colours. The downside of dithering is that on some panels the flickering effect may be noticeable, particularly during moving footage. Typically, most computer screens, printers and web software all work within the standard sRGB colour space, and nearly every monitor on the market should be capable of reproducing all the colours within this space. Often, monitors will quote the coverage they have of the larger Adobe RGB colour space, which you will usually see referred to as a percentage, such as 93% Adobe RGB. Photographers should look for the monitors that have the highest colour depth within their price range, preferably those with an 8-bit, 16.7-million-colour display. Screens capable of reproducing a wider range of colours are beneficial when it comes to editing images in a wide colour space. Most DSLR cameras can record raw images with a bit depth of 10, 12 or even 14-bit, so the more colours that a monitor is capable of reproducing, the better. The most common form of digital connection is a DVI socket. However, this is complicated by the fact that there are two types of DVI socket, although both have the same fitting. A DVI-D socket only accepts a digital input, so it can only be attached to a DVI output on a computer. However, a DVI-I socket allows a digital or analogue connection. The analogue connection can be in the form of a VGA cable with a converter attached to transform the VGA plug into a DVI fitting. An analogue-to-digital converter within the monitor then converts the signal. Look for a DVI-I monitor connection if your computer only has a VGA output, which will mean that the monitor can still be used if you ever update to a newer computer with a digital monitor connection. One connection most people will be familiar with is a High Definition Multimedia Interface (HDMI). This is capable of transmitting both high-definition video and audio signals and as such is commonly used for connecting DVD and Blu-Ray players to televisions. HDMI connections are also now becoming common in digital cameras. This gives you the option to connect a camera directly to a monitor when displaying images. Newer monitors may also feature a DisplayPort connection. This connection is slowly being adopted by more and more manufacturers. Apple has now introduced a Mini DisplayPort, which is a smaller version of the standard connection. Like HDMI connections, a DisplayPort can transmit both audio and video signals. It is always best to edit images in soft, subdued neutral lighting, but this isn’t always possible. Using a monitor hood helps reduce any light and reflections that may affect your view of the screen. Some monitors have USB ports that allow peripheral devices, such as card readers, to be connected conveniently without having to connect them directly to the computer. Some monitors have built-in speakers, microphones and even webcams. Although these aren’t needed for image editing, they are useful for saving space on your computer desk.